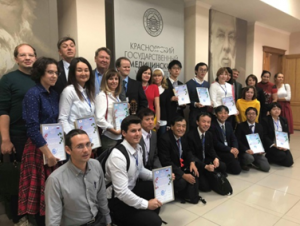 On September 20th and 21st, Kanazawa University and the Russian partner universities involved in the project “Training Program for Russia-Japan Innovative Leaders of Tomorrow” hosted the Russia-Japan Medical Symposium in the fields of medical and pharmaceutical sciences at Krasnoyarsk State Medical University named after Professor V.F. Voino-Yasenetsky. 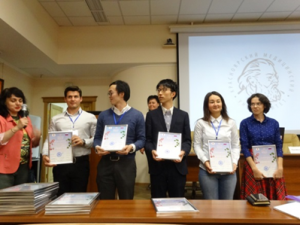 Four faculty and 4 graduate students from Kanazawa University, and faculty and graduate students from the cooperating Russian universities participated in the event. On September 20th, the first day of the symposium, the Japanese and Russian graduate students made poster presentations at a pre-symposium event. The chairpersons awarded the poster prize to the graduate students who made the best presentations including 2 graduate students from Kanazawa University. 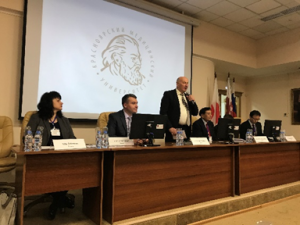 Rector Ivan P. Artyukhov of Krasnoyarsk State Medical University gave the opening remarks, and the researchers from Kanazawa University and the Russian partner universities presented their researches. 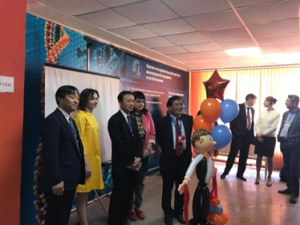 On September 21st, the second day of the symposium, the Opening Ceremony of Krasnoyarsk - Kanazawa Research Station – Social Brain Lab - under the supervision of Prof. Haruhiro Higashida, Research Center for Child Mental Development, Kanazawa University, took place with the symposium participants as witnesses. After the ceremony, the researchers from two nations presented their researches in two groups classified by nervous system and pharmacy system. During the discussion, they actively exchanged their opinions. Copyright © 2017 Kanazawa University.